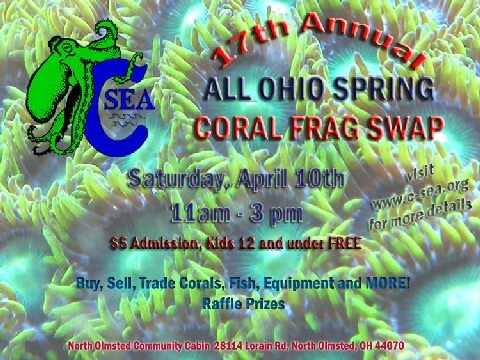 Over 354 attendants have registered, and hundreds more expected at today’s 17th Annual All Ohio Frag Swap. The swap, sponsored by C-Sea, will be held at the North Olmsted Community Cabin, 28114 Lorain Rd, North Olmstead, OH 44070. The doors open to the public at 11 a.m. The All Ohio Frag Swap has grown in popularity over the past few years, with both vendor and attendant number rising steadily. Last year’s even was a huge success, as hundreds of reef hobbyists swarmed over full crop of some of the nicest corals around. This year’s event promises to raise the bar ones again, displaying the latest and greatest in reef gadgets and gizmos, and an even better raffle. The swap went well yesterday. I had a good time.